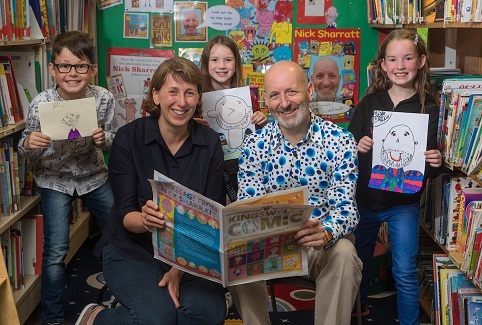 Pupils at Kingswells Primary School today (Tuesday 27 June) unveiled a unique and lasting memento to their work with the school’s outgoing reading patron, illustrator and author, Nick Sharratt…a school comic. Kingswells School has been participating in the Patron of Reading scheme for the past three years with Nick as Patron. Kingswells Comic was developed by collecting artwork from pupils throughout the school and with the help of a parent who lectures at Robert Gordon University’s Gray’s School of Art and two students from theCommunication Design course, they developed the work into a lasting memento for Nick. Nick, who is best-known for his illustrations for the work of Jacqueline Wilson, Jeremy Strong and Kes Gray and his own works ‘Elephant Wellyphant’ and his first novel ‘The Cat and the King’ was paying his final visit to the school today to celebrate his time as Patron. Nick said: “It’s been a privilege to have been Patron of Reading at Kingswells School over the past three years. I’ve thoroughly enjoyed visiting the school on a regular basis and having had the opportunity to form a real relationship with the pupils and staff. Marie Simpson, from Gray’s School of Art, added: “As a parent of children at Kingswells Primary School it has been an absolute pleasure to see how much they have enjoyed working with Nick, who really has fulfilled his role as Patron helping and encouraging the youngsters at every step of the way.